The Lake Havasu Area Chamber Ambassadors held a ribbon cutting ceremony for Alzheimer’s/Dementia Connection of Havasu celebrating its new membership with the Chamber. Attending the ribbon cutting were Dennis Weuve, Beth Biehn, Rose Bielke, Paula Anderson, Gordon Feller, Melissa Henak, Michele Kirkpatrick, Heather Minery, Candy Mitchell, Debra Pulido, Peggy Ryerson, Patti White, and Monica Hall. 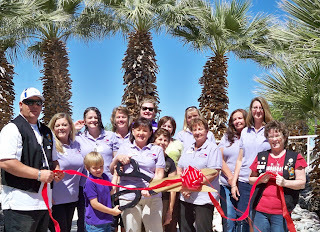 Alzheimer’s/Dementia Connection of Havasu is a non-profit organization dedicated to providing support and education regarding issues related to dementia. The organization offer support groups and educational forums every Tuesday. For more information on support or to become a volunteer call 928-855-6000.